Amazon is reportedly close to finalizing a Web video licensing agreement with Viacom and is nearly ready to launch a standalone video subscription service that would challenge Netflix. People familiar with the negotiations between Amazon and Viacom told Reuters that a deal could be announced as soon as this week. Viacom CEO Philippe Dauman teased last week that the company would announce a new online deal this week, but he declined to provide more details. Amazon has already reached agreements with major studios including CBS, Warner Bros, Fox, Sony, NBC Universal and Walt Disney for its Prime Instant Video service, but the company is believed to have ambitions for a standalone service as well. People who have spoken with Amazon executives told the publication that the online retailer is looking to create a non-Prime video service to spur sales of the Kindle Fire tablet. Multiple sources said Amazon is currently in negotiations with Hollywood studios to expand its licensing rights and add to its library. Though the company does compete with Apple's iTunes to offer digital videos for purchase or rental, it is apparently also set on going after Netflix in the subscription video market. 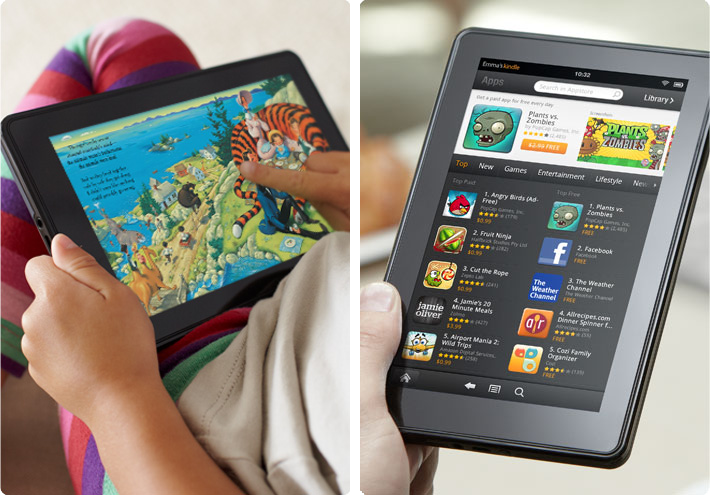 The Kindle Fire arrived last November with a low $199 price tag. Amazon bundles a 30-day free trial of Amazon Prime with the tablet in hopes of drawing customers into its ecosystem. Prime costs $79 a year and offers customers free two-day shipping in the U.S. for most items in addition to access to video content. The company relies heavily on content sales since the Fire is believed to be sold at a loss. Amazon's net income declined by 57 percent last quarter even as Kindle sales shot up by 177 percent year over year. The company declines to provide specifics on how many Kindle devices it has sold, though it has indicated that sales are in the "millions of units." Analysts on average believe Amazon sold five million Kindle Fire units last quarter, though Sitfel NIcolaus' Jordan Rohan estimated last month that the company shipped as many as six million during the period. A recent survey revealed that 29 percent of Kindle Fire owners, which made up six percent of respondents, plan to spend more at Amazon over the next 90 days. That's compared to an average of 20 percent of consumers. The company could, however, face problems with customer satisfaction, as the same survey showed that only 54 percent of Kindle Fire owners are "very satisfied" with the device, compared to 74 percent of iPad owners who answered a November survey. Downloads of Amazon's video offerings saw healthy growth last quarter after the Kindle Fire release. Instant video purchases or rentals more than doubled during the December quarter, while the number of Prime Instant Video streams jumped up almost 300 percent year over year, the company said last month. For its part, rival Apple has reportedly been met with resistance in its own efforts to negotiate subscription streaming deals from Hollywood and TV studios. Last November, CBS executive Les Moonves revealed that he had rejected an "advertiser split" online streaming offer from Apple because it refused to enter into "success-based or non-guaranteed" agreements. Sterne Agee analyst Shaw Wu said late last year that Apple hopes to offer content subscriptions with customized channel lineups, but licensing agreements for such a service have turned out to be "much more complicated" than current deals. Separately, Jefferies analyst Peter Misek said he believes Apple may choose to work with existing cable providers for its rumored connected television set. His claims gained some credibility soon after when The Globe and Mail reported that Canadian telecommunications companies Rogers and Bell Canada already have a prototype "iTV" in their labs.